Hoola endeavours to re-create the traditional "Hollywood" Hawaiian sound. Most "island shows" around the traps are South Sea Polynesian / percussion based. Hoola's show is different in that it has the string band sound of bass, guitar, ukulele and steel guitar as a backdrop to the old classic Hawaiian hits. Hoola plays it "hot & sweet". Hoola can also play in an acoustic Hawaiian mode as well as incorporate quite a number of jazz tunes which lend themselves very nicely to this kind of treatment. 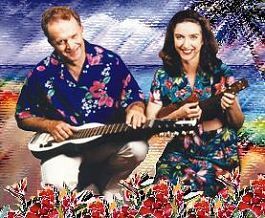 You can have this exotic & exciting island/Hawaiian sound in any format from a duo up to a full band. From a debut appearance at Darling Harbour, Hoola has performed on harbour cruises, in cabaret ("Lost Vegas" at the Metro), and clubs and even appeared at the 1996 "Homebake" pop fest.